Few weeks ago, I bought Butterfly Super Anti, Yasaka Anti Power, and Nittaku Best Anti. So far I have only been able to try the Anti Power and the Super Anti. I will add to this blog entry as play more with the anti rubbers. So far I am not impressed. The pluses do not out weigh the minuses. First I have a relatively good BH with which I can pressure or attack. I feel I give that up when I use anti rubber. I can only block and flat hit and hope the opponent screws up and dumps a ball into the net. The good thing about playing with anti is that it can block very fast drives and loops and the anti rubber takes a lot of pace off the ball. Also, once the opponent realizes that they dumping balls in the net they become more cautious and that give me more opportunities to attack with my FH. Also I have found that my BH is avoided. I have the Super Anti mounted on my TBS with Tenergy 05 on the FH. The Anti Power is on my Samsonov Alpha with Mark V max on the FH. The basic difference between Super Anti and Anti Power is that Super Anti’s top sheet has less friction than the Anti Power but neither rubber is a frictionless as I would want and neither are close to Pogo 0X LP in that regard. I think this difference is easy to see. The other big difference is the ‘speed’ or how bouncy the rubbers are. The Anti Power seems to be the deader of the two rubbers. Rarely have hard hit balls bounced long with the Anti power and sometimes in close touch situations I have failed to hit the ball hard enough to get it over the net. 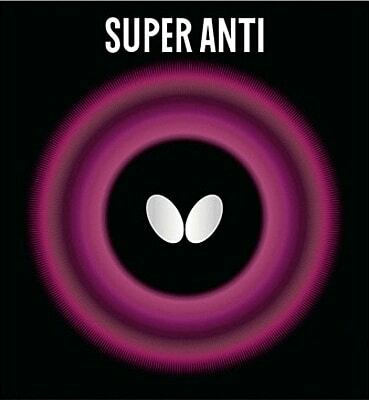 Super Anti is ‘faster’. I think this is obvious too. At this time I prefer the Super Anti because it does slip the balls a little more and allows a little more ‘spin reversal’ even though it doesn’t do quite as well at blocking fast drives and loops because it is more lively. If I do get the ball back the ‘spin reversal’ will be a bigger problem for the opponent. At this point I would rather play with the Pogo LP 0X than anti. LPs cause much more fear, uncertainty and doubt than the anti but LP is harder to play with and don’t block the hard shots as well as anti. I can attack with top spin with LPs which is something I give up with anti. I played against an experience player that had played with anti before but now uses SP on his BH. He was a good looper too. We just hit balls but he was doing slightly better until I tried chopping with the anti. That seem to be the weak spot. He had great difficult with my chops. Meanwhile the H2 Neo played well. No big adjustment was needed. It seemed natural. I don’t think H2 Neo is all the hype makes it out to be but it is a good rubber. When hitting backhands I switched the H2 Neo to the BH and it played well. The general consensus I get from almost every body is that I shouldn’t be using anti. My BH is too good relatively to be screwing around with anti or LPs. I did find I could play better with anti if I was more aggressive with my shots. Anti rubber is not as frictionless we are led to believe. I still have to watch out for spinny serves but they didn’t affect the anti as much. I could put top spin on the ball but it takes a more open or vertical stroke to do so and as I said the chopping seemed to work well too. I played the best with my Instinct+2xReflectoid. I beat a young looper that I hadn’t beat before. This looper would spin balls off my paddle until last night. I watched many times of the Henzel video. I liked his tomahawk serve. Monkey see monkey do. I now have a wicked tomahawk serve. It keeps me in games that I would lose otherwise. I serve them fast, low, long, at all angles and very spinny. Loopers have a lot of problems trying to do opening loops on these serves and I don’t give them time to react. I have learned from the videos on this site. I see what is possible and then I do my monkey see monkey do imitation. Tomorrow, I take the Samsonov Alpha with H2 Neo and Anti Power and my TBS+T05+Super Anti to the club along with my favorite Instinct+2xReflectoid. I have now played with all three of the anti rubbers I bought. Again they are the Butterfly Super Anti, Yasaka Anti Power, Nittaku Best Anti. Actually I didn’t find that much difference between them. If I someone asks me which one to try first I would say the Nittaku Best Anti. Best Anti is as good as the Super Anti at absorbing fast balls returning balls without modifying the spin or what most call spin reversal. The big difference is that Best Anti is cheaper, almost as cheap as some CN rubbers. Power Anti does not seem to be quite as anti as the other two but the difference is slight. Too be fair I didn’t test all the rubbers on the same paddle. The Super Anti is on a TBS, the Best Anti is on a BalsaCarbo X5 and the Anti Power was on my Samsonov Alpha. My first impressions when trying anti rubbers is that they were not as anti as I expected. You can’t just put the paddle in the way of a fast ball and expect it to go back. The paddle must be angled or closed correctly as anti does have some friction. When blocking loops one still must estimate the speed and top spin of the incoming ball accurately to close the paddle correctly. There is no magic here. I had played with Pogo 0X before and the anti rubbers respond more to the spin than the LP. The anti rubbers do a better job of absorbing energy than the 0X LP but the anti ‘spin reversal’ is is not as great. I found that I can chop with all the anti rubbers. It is relatively easy. I have this drill where I loop one and then chop one. I found this to be the best/safest option if caught back from the table and the ball is low. You can’t loop with anti. You can get some top spin and will notice a little drop but it isn’t like what you get from an offensive inverted. 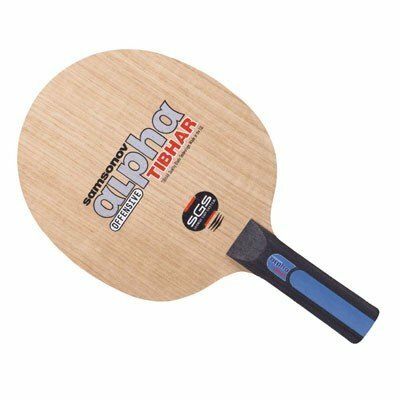 Hitting with top spin back from the table takes a little getting used to because the paddle must be very open compared to other offensive inverted rubbers. There simply isn’t the same tangential impulse ( geek speak ) with anti rubber. I spent a few hours with the Newgy with up to 5 paddles in front of me right there at the table so I could quickly switch between the paddles. I also compared my Toxic 5+Peacekeeper and my 729 Bomb+Reflectoid+Pogo LP 0X. I set the Newgy up to shoot balls at different speeds but I didn’t change the angle. I wanted to be able to simply hold the paddles in one place and see how the ball bounced back. When I set the Newgy up to shoot balls at different speeds ,I was interested in how the balls return. For instance the LP paddle was much more sensitive to how the paddle was closed compared to anti rubbers. I could hold the paddles with anti at one angle and the different speed balls would all land. Early on when playing against people, I found I couldn’t be passive with anti. You still have to win points. It took me a while to realize this. At first I was just blocking balls back waiting for the opponent to dump the ball into the net. It happened but not enough. What is also strange is that some people don’t hit balls with a lot of top spin and they seem to be almost immune. What I did find interesting is that people would over react to my attempts at putting spin on the ball and over compensate. I also found that if I hit ball harder with a top spin motion I can get enough top spin at times to get the balls to drop. With my Pogo LP 0X I get much more spin reversal, many more floating or wobbly balls and balls that seem to just stop and drop. To compensate, the anti rubbers are much easier to learn how to play with but I lose a lot of attacking ability. I can flat hit but mostly I use the anti to setup my FH. Simply blocking and pushing balls back like PushBlocker does with his LP doesn’t work or perhaps PushBlocker isn’t simply pushing and blocking. I have found that I can block extremely well with almost any inverted rubber. If you block with T05 close of the bounce the balls speed will be killed. The paddle will need to be closed correctly but it works. The balls return very quickly to the opponent but with top spin. If I do the same with anti the ball returns with much less speed but with back spin. Now if one learns to twiddle between shots this will confuse the opponent. I am convinced that one of the keys to playing with anti is twiddling. I need to take a paddle home and just sit in front of the TV and twiddle paddle so I can do it quickly and without thinking about it so I always have the right side available. I will keep the anti rubbers on my paddle for a while to see if I get better at using them. I like the fact they are light. If I can keep the FUD ( fear uncertainty doubt ) factor high with anti I may keep them on but Best Anti is now my anti of choice. One of the things I need to learn is to twiddle. There is always something to learn. You will find that different players will approach you differently. If I were to play you I would serve heavy spin varieties to your forehand a lot and also long fast serves to your anti and after your return avoid your fh the whole time. Good players will smile and say great he is using a dead no spin rubber and just keep aiming at it. You will get a few early points until they adjust. Finally, if you want less spin with your anti or long pimples it is easy. I used to put them on the dashboard of my car so the sun would cook them for a few hours. Trust me it really works. I tested a normal inverted like that to see how far I could go and then it eventually after a week was totally cracked up. I would need to wait till I have chance to use your method. I bought the RD with the idea of putting it on my TBS. Fortunately I have the original RD not the more recent GCS version. Anti is is not anti enough. It isn’t treacherous enough. It doesn’t suit my personality. The rubber has got fit in the the “old age and treachery will overcome youth and skill” or fit in with my ball whacker game. Anti is not treacherous enough or let me whack balls. I will still try the Best Anti to give it a fair shot I don’t have any real hope for anti. I can absorb shots just as well with Reflectoid and I can still attack or put spin on the balls. LPs are still in the running but I didn’t use them last night at the club. I know when you buy a rubber its the full set. Why don’t get some cheap chinese short pips with medium sponge medium thickness. Like a middle ground between hardbat and still being able to spin a bit. At some point you have think it is a victory just to be able play. I have lost a lot of weight and inches off my waist so TT is good for me even though I am not that good. 802-40 SP 1.8 mm which I might have some fun with this one. It may fit my ball whacker mode. Besides, I also bought 563 MP 1.5mm where I have no clue what to do with this one. I will just have to find out. I probably should have bought a Pogo LP with 0.6mm sponge but I didn’t. Next time maybe. These pips out rubbers are so inexpensive. It just takes time. I also must coordinate colors so I have a black and red rubber. I try out most of my rubbers on my Samsonov Alpha but I have found out that any rubber I cut for the Samsonov Alpha will not cover another blade. The Samsonov Alpha has a small blade. funny the guy I was thinking about that uses short pimples that I always refer to, Dennis, is one of the few people that have a key to our club. Had a hit with and Ben just a bit a go. I’ll talk about that elsewhere. Coordination is fun isn’t it, in HK I used double red for half the time there Blitz and Red diamond, not one person commented. Here is a tip for you, from now on all your pips should be red and all your inverted rubbers black. simple… I think you will end up always using both spin and not right? Most my serves are fundamentally a tomahawk serve, I throw in the traditional sidespin for contrast. Half the tomohawks are the full spin the others are as low and short as possible. Unless it is about anti reflecting the topic. I only woke up this thread because I was wondering since the rubber is meant to kill speed would yasaka anti power 1.5 be faster or slower when blocking compared to the thicker varieties. I didn’t buy both 1.5mm and 2mm. I don’t think the thickness of rubber has much to do with speed. It will be a trade off of better feel for the thinner rubber and the ability to absorb harder shots with the thicker rubber. I need to do a simulation to answer this question to know for sure. Do you remember that post I made about the little 0.5mm springs? I need to do that simulation using differential equations. They were the only choices at the paddle palace. 🙁 I didn’t realize until this thread that there is 1.5mm anti. Butterfly Super Anti appears to come in only one size too. I would think the trade of would be spin reversal and control for blocking and attack ability. 1.5 mm should be better for spin reversal because the ball wouldn’t go as far into the rubber to create friction. The thick rubber would be able to absorb more energy before bottoming out. Also the ball would sink farther into the rubber so more of the ball would be in contact with the rubber and create more spin for attacks. Some day I might get a sheet of 1.5 Best Anti and compare it but now I am still trying to be faithful to my blocker paddle. I played with my LP and Best Anti against the robot at different speeds and distances from the table. Close to the table LP and Best Anti have similar spin reversal. The blocking is similar and it is hard to tell which is best. At high speeds, Best Anti tends to bottom out even though I have 2mm. The LPs can’t bottom out. I also found that LPs are better for hitting from long distance. I can put top spin on the ball with LPs much easier than I could with Best Anti. Both Best Anti and Pogo 0X LP chop about equally well. I don’t play back that often so I don’t know if this should make a difference in my ultimate selection of rubber that I chose. For now I will stick to Lps. I was recently asked about the best spin stopping attack rubber. Could you make a single answer to do this? I know 802-40 isn’t it. It is closer to an inverted rubbe. I would say 755 0X or an anti rubber are good for returning knucke balls. Perhaps a medium pip like 563. My first choice would be 755 0X and my second choice Yasaka Anti Power for returning knuckle balls, Third would be Pogo LP 0X. The problem with stopping the spin and returning a knuckle ball is that they float and often float where you don’t want them too. If you have a clear line of sight to the table then one can attack with knuckle balls but if the ball is low then care is required as knuckle balls will often float long. When the knuckle balls don’t float long the effect is great because the ball seems to just drop out of the air on to the table. This often surprises the opponent. I found that when I play with pips I always try to top spin the ball when attacking so that the flight path is more predictable. This is harder to do with Pogo 0X LP. It can be done but it takes a big stroke and often I don’t have the time. Half assed attempts at top spin only neutralized the opponent spin with Pogo 0X which may be what your friend wants but like I said, these balls float. Well to me the two seem mutually exclusive: the more you kill spin the less you can attack and vice versa. that is why pips such as the 802 being more like inverted will give you more chance to attack and yet being more like pips give you some spin indifference.